OK, the article is down. Now here is my legally compliant review, with only little bits quoted in accordance with the "fair use" provision, and the rest reported in my own words. (The previous version allowed complete fairness to the author of the article by quoting her words exactly.) Following the Zuhlsdorf convention, at various points, there are my emphases in black and my comments in red. It's a bit ragged in places and you can see the joins - but hey! I'm not spending all night on this nonsense. 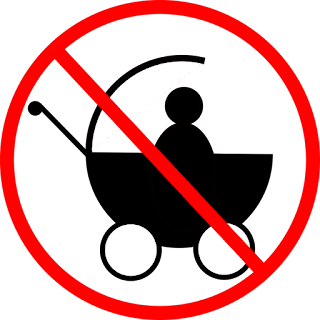 I must add a little extra to this revised post from information received. I understand that the Tablet was indeed intending to "have a go" at a parish that offered the usus antiquior. Another Southwark parish was in the crosshairs but mine was set as the target because there were a few parishioners prepared to go on record. 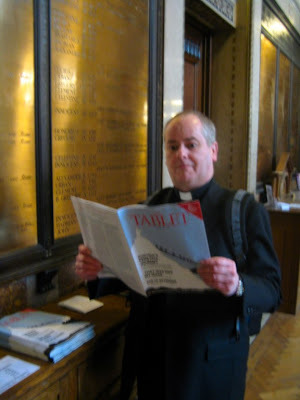 I also hear that the Tablet regards the Catholic blogosphere as a "tiny conservative world". As I say - they just don't understand the internet. If you tot up the combined readership of the Catholic blogs which have written on this issue, they have a daily readership far in excess of the Tablet's weekly circulation. One reason for that low circulation is that the Tablet thinks that enforcing copyright on the internet helps their cause. Bwahahaha! A review and observations on the article "That was not my Mass" by Elena Curti, published in The Tablet. The exordium gets us in the mood: "Each Sunday at around 9.45 a.m." [or earlier - youngsters get there up to an hour before Mass to help prepare] a team at Our Lady of the Rosary, blah blah gold crucifix... candlesticks... flowers... altar cards... old Latin Mass. "Welcome to the parish of Fr Tim Finigan." It was mentioned that at the Sunday evening Mass in the new rite, there are no bidding prayers and the congregation is not invited to exchange the sign of peace. [At the other new-rite Sunday Masses, these things are all available.] Then we have the great liberal war cry: "Fr Finigan says the Eucharistic Prayer with his back to the congregation." A claim was reported that the people who welcome the older form of the Mass are predominantly newcomers living outside the parish. The claim is false. Then there was some stuff about only "Six parishioners" wanting the "Latin Mass." I have no idea where that number comes from: there are far mor than that. There was also the obligatory use of the word "imposed." The usus antiquior is not imposed on anyone - we have four weekend precept Masses, three of them in English in the novus ordo. It was reported that critics complained that there was little opportunity for parishioners to meet socially after Mass. In fact, whenever I talk about silence in Church, I always affirm the importance of social interaction outside or in the Hall. There were also complaints about their priest’s refusal to support Cafod, his expenditure on traditional vestments and other clerical garb, the absence of a parish council and failure to account to parishioners how money from the collection plate was being spent. I consider this to be a cheap shot and address the matter below. My response was reported as "a 35 page essay." In fact the emails to which I was responding ran to a total of over 20,000 words and included many misconceptions regarding the Liturgy (such as the above) which I felt it necessary to address. You can read my response here: Sacred and Great. My address to the LMS was also mentioned - as the real strategy behind all this. I did indeed refer to priests as the "infantry" who needed to overcome "problems and difficulties" over the introduction of the extraordinary form into parishes. One problem would be overcoming the idea that the laity are "co-celebrants" with the priest (a doctrinal error condemned by Pope Pius XII.) The reference to "infantry" was an allusion to the phrase "poor bloody infantry" who are at times attacked by both officers and civilians. This sometimes ring true for parish clergy. The article correctly represented my opinion, confirmed by other priests with reference to most things that happen in parishes, that there are a few who are very much in favour, a few who are strongly against, and “the substantial majority who simply wonder what Father is doing now”. Then there was the "stable group" thing. I was reported as "admitting" that there was not a stable group. There certainly is a stable group - what I did not do was to get them to draw up a petition etc. I read SP as allowing the pastor to introduce the usus antiquior for pastoral reasons and felt it was more honest to do just that. (See my post 'If ... but not "only if"'). I think that Cardinal Hoyos supports this position. Just a note on finances. The bit about vestments and clerical garb (Boo! Hiss!) is, as I said, a cheap shot. It is a part of my responsibility to ensure that there are dignified vestments for the Liturgy. Gradually, over 11 years, I have spent judiciously in accordance with our budget to secure worthy vestments. 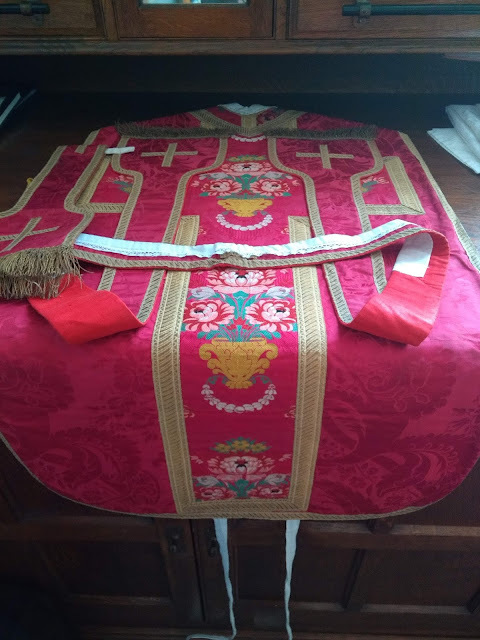 I have also recovered a substantial quantity of vestments and other liturgical artefacts free of charge from people who did not have any use for them (i.e. might have thrown them out.) "Clerical garb" probably refers to things like my cassock and Ferraiuolo etc. These come out of my own pocket - thankfully, the parishioners as a whole are very generous at Christmas and Easter (significantly more generous this Christmas than usual). Over the past few years, helped by many parishioners, I have also, among other works, replaced the roof, floor, heating and lighting in the Hall, put in disabled toilets and levelled the entrance, repainted the interior of the Church, replaced the roof on two areas, replaced the guttering, replaced the public address system, put in an industrial spec kitchen in the Club (for the lunch club to provide lunch every week for 40 elderly people without falling foul of health and safety law). We also raise money regularly for the Bexley Deanery Third World Project, Aid to the Church in Need, the Manna Centre for the Homeless, the Bexley Centre for the Unemployed, the Good Counsel Network, and Cardiac Research in the Young to name but a few. In place of CAFOD, I send our Family Fast Day money to the Pontifical Council Cor Unum (which CAFOD is a partner of, I think.) That way, we support the Church's development work without contributing to glossy advertising or a questionable policy on HIV prevention. "If I don’t read an article like that every week or so, I have to examine my conscience." Admirable - but daunting. 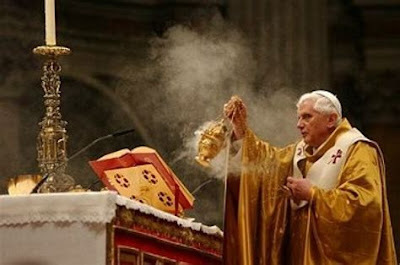 A man to admire and emulate not only in liturgical matters.